Under construction. This is a course about having fun building three small robots and finding out how to teach them to do what you want them to do. During this course you will teach your robot to approach a pretend Alien, go around a pretend Moon, clean a pretend floor, and follow a line, plus some classroom-useful extras. A 17-page pdf overview of our original course (without extras) is available for download here. Let’s start! Extras useful in a classroom: Many of these tutorials are similar to those in our free DrGraeme.org and Udemy courses, but when completed, this course will also contain extra tutorials (e.g. Tug-Of-War, Mexican Wave, Robot SUMO, two-sensor line following, setting up line and walled mazes, avoiding an obstacle on a line, RoboCup information, etc.) which are suitable for classroom use when more than one EV3 set and/or extra components are available for use by students. It will also include some additional comments/videos that may assist new teacher/mentors/parents to introduce students to EV3 robotics, while at the same time clarifying our approach to this delightful task. 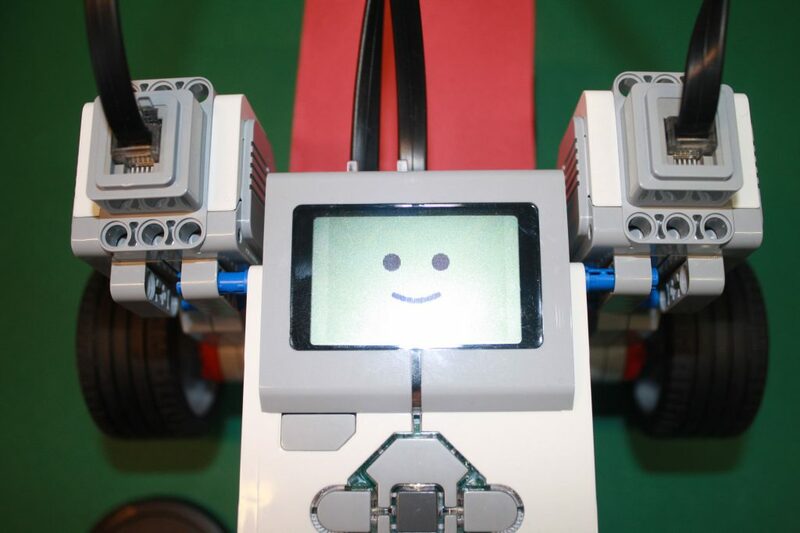 This course aims to add some of the background to our “Fun with LEGO MindStorms EV3 Robots for Absolute Beginners” course. It includes why we have made some of our decisions regarding course structure, coverage and layout. It also will include some sample solutions for the “Challenges” in the “Fun with LEGO MindStorms EV3 Robots for Absolute Beginners” course. When competed, access to this course will be somewhat restricted, so that students will not have these “Challenge” solutions easily available to copy. How to download LEGO’s free coding and editing software. LEGO MindStorms EV3 software – why do we need it? How can we make our Robot Botticelli move: Parts 1 & 2 of 4? How do we update our Robot’s “Firmware” : Part 3 of 4? How do we teach our Robot Botticelli to move: Part 4 of 4? Teaching your Robot to move, smile and speak. Teaching our robot to move, smile and speak – overview. How do we teach Botticelli to smile? What do we do when our Robot reaches the Alien? What if the Alien’s Universal Translator is not working? How can you bring your Robot back safely from the Alien? Changing Botticelli into LucyBot – Part 1. How to send LucyBot out to the Moon. Sending Lucybot around our pretend Moon. How to land LucyBot back on our pretend Earth. Moon journeys by Robots taught by advanced students. A Robot Floor Cleaner? – Overview. Four Floor Cleaner runs from a TAG workshop. Extra – LEGO EV3 Robot Tug-of-War! If you are in a class group which has more than one robot kit, then we can have a Tug-of-War competition. We can either use our present robot, or build an entirely new robot for this Challenge. Building YayaBot Part 2 – Education set only. Building YayaBot Part 2 – Home Set only. Extra – SUMO – Overview. Extra – Finding a black line using the Color Sensor. Extra – Teaching YayaBot to stop at a black line. Extra – Staying inside a SUMO ring. Follow the edge of a line. Follow the edge of a line – Part 1 of 2. Follow the edge of a line – Part 2 of 2. Extra – Setting up Line Mazes. Extra – Toys in the Swimming Pool. Extra – Clearing Toys from a Swimming Pool. Extra – A Robot that rescues a “Person” from a “Swamp”. One of the Challenges from RoboCup Junior is a Rescue Challenge where a Robot follows a line around an arena, meeting various Challenges on the way, and finally rescuing the “Person” by pushing them out of the “Swamp”. One of the challenges in many competitions is to avoid an obstacle that is blocking the line your Robot is following. Often this “obstacle” is a soft drink bottle filled with water, or it may be a lump of rock or a chunk of wood. How can we teach our Robot to avoid this obstacle and continue to follow the line? As well as teaching our Robots to follow the edge of a line using one Color Sensor, we can also teach our Robot how to use two Color Sensors. Some people thing there may be some advantages using two Color Sensors. Let us experiment, and see if they are right.